Shanghai is hosting the World's fair this year. There are alot of very interesting national pavilions being constructed (discounting the very lame US entry). 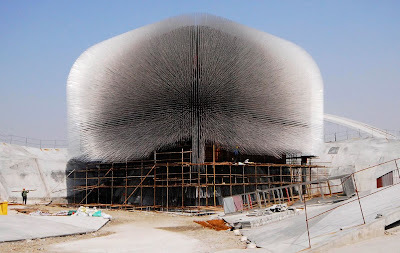 The one that has really caught my eye is the UK pavilion which has a "seed cathedral". 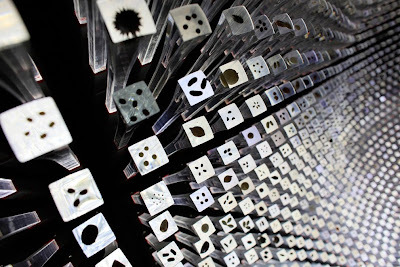 It is a giant cube reminiscent of a dandelion which has thousands of clear acrylic rods which act as fiber optics transferring light to the interior of the box. Each rod is ended with a different seed encased in acrylic. I went to the link to look at the other pavilions. They are really amazing. What happens to these pavilions after the world fair is over? Most of them are dismanteled. It is part of the rules for building a pavilion that it must be taken away at the end of the fair. Only a few will remain. The Effiel tower was built for a world's fair and afterwards there were alot of people who thought it should have been taken down.